This week I wanted to read Anne. I just wanted to sink back into the couch with a good friend and reconnect. I made it through Anne of Windy Poplars during the L.M. Montgomery Challenge but I hadn't been able to move beyond that until this week. Ah, Anne, my old and dear friend! I have two copies of this book. One is a first edition from A.L. Burt Company - 1917. I remember finding it in an antique store down in South Texas. I was wild with delight! This is the original cover art that you see pictured here. I love my older copy but it's seen it's fair share of hands so I read my Bantom Classic Edition (1987) this time which you can see pictured below. I have to say I like the 1987 cover art better - even though it does depict Gilbert as having red hair which is outrageous, to be sure. Clearly the artist had never read the book. I like the cover art on the 1987 book because it shows Anne and Gilbert, walking together arm-in-arm - married at last! Hurray! No more annoying little letters from Windy Poplars. No more college aged Anne. A relaxed and happy married woman is how we find her in this book -- building her house of dreams. This book is a sensible romance. HAHA! If you know me around here, you know I HATE romance books. They are so ridiculously over done. The relationships that you find in most modern romance novels are not real at all and are seemingly written for one single purpose - to make girls swoon over the lead male character and drool a bit while thinking that love is always widely exciting. It's been a long time since I've read this particular title and I had forgotten quite a few of the particulars. 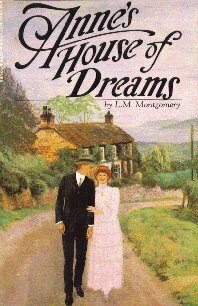 I had forgotten, for instance, that Anne and Gilbert spent their honeymoon in their own new House of Dreams. I loved visiting Four Winds. 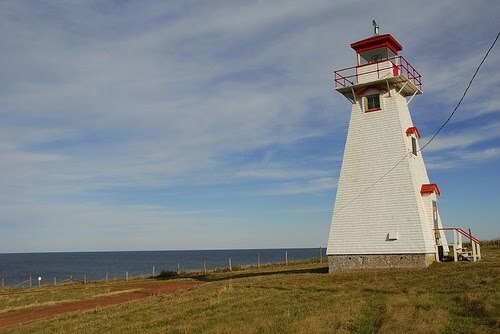 I looked up online to find out where Four Winds is on Prince Edward Island and the information suggests that it's on the north side of the Island. In this particular setting, Anne and Gilbert meet and make friends with Captain Jim who tends the lighthouse. "Oh -- dreams," sighed Anne. " I can't dream now, Captain Jim -- I'm done with dreams." A phrase that is used in this book quite often is the following: "heart-glad." Heart-glad is exactly what Anne's House of Dreams makes me. It was a delightful and refreshing read and if you haven't read through the Anne series, I hope you'll press through to at least this special title. As for me, I have a few more titles to look forward to and I mean to get to them sooner, rather than later - that's what! Actually, reading your Anne posts makes me sad. I can't think of an author or book that I treasure the way you do these. But I forgive you. :-) Actually it inspires me to keep looking! And I LOVE that old book. Gorgeous. 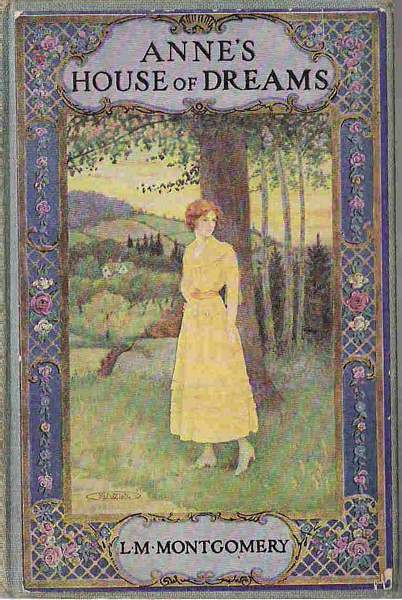 Oh, how I loved Anne when I was a teenager! When I got married I gave away all my Anne books to my husbands' teenaged cousin, who I'm pretty sure did not appreciate them like I did! Do you know if they still sell them in those boxed sets? Also...do you know of a really good biography of L.M. Montgomery? I found one that looked good at the bookstore, but I'm glad I researched it first b/c I found the author had put some, ahem...not *nice* stuff in it. Can you point me toward a good one? What a beautiful old edition - thank you for sharing! Hey MB - Yes, they do still sell the boxed sets. I'll e-mail you on the side as well. I'm not directing the following commentary at you but it raises an interesting point since you mentioned that you saw a bio with some "iffy" stuff in it. LMM's life was not really very pretty. I think it's important for Christians to note that LMM really wasn't one. I don't like Anne because I think LMM was a Christian. I like Anne as-is. Author flaws and all. LMM DOES present a calm and peaceful world view, but you can read her bio and then between the lines of each of her books and realize she had a different view. Does that make me like her less? No. Does it make me sad? Yes. But I STILL LOVE her fiction. Thanks for the info. I had know idea LMM wasn't a Christian. I don't know anything about her life at all, really. But it makes no difference to me. Her writing is still breathtaking, comforting, and beautiful. Thanks for responding! I loved this book when I read it for the challenge this year! Carrie, great point in the comments about LMM and Christianity. I find that many authors, today and in the past, share Christian-type words or phrases, or their characters go to church, but that doesn't mean they have a Christian world-view. I just read this recently and I cracked up when Mrs. Lynde checks out what's in Anne's trash when she comes to visit. I'm not sure that my trash would give such a good report! I know you wrote this two years ago, but I've just found it, and I adore it. It's my first visit to your blog, and I wonder already if perhaps you might just be a kindred spirit. Anyone's idea of a perfect day and a perfect way to relax (which of course must include a comfort book) is to reach for an old, much-love copy of Anne, has to be. I was actually thinking about and searching for the lighthouse. Captain Jim is the inspiration for a character I want to write about, and having the lighthouse (and a picture of an old, weathered man who fits just the image I've always had in my head) is helping.